We all know that the 60s were a weird time. But that creativity that persisted throughout America brought us some cool stuff. And So-Cal surfer Bruce Meyers brought us this: the Dune Buggy. Meyers was an artist, engineer, and even has some experience building sailboats. So he took the ubiquitous-in-California-in-1964 Volkswagen Beetle and ripped the body off it. Replacing it with an open-top fiberglass shell and big, off-road tires, it looked every bit the part of an off-road racer. He started selling kits in 1964 but they were expensive and he only found 12 takers. Then he set up a real business and the Manx took off. This one is powered by a 1.8-liter VW flat-four (it was originally a 1.6). Production lasted through 1971 when tax problems forced the company to close. At the dawn of the new millennium, Meyers got back into business and you can still buy a Manx kit today. The original run saw about 6,000 made (from 1965-1971). This one is titled as a ’63 because that’s the year of the VW underneath it. 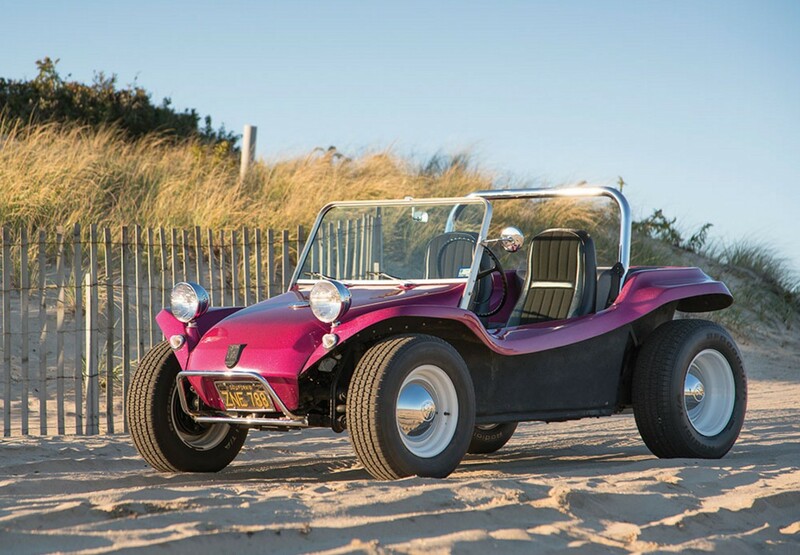 There are a lot of Beetle-based dune buggies out there, but a true Meyers Manx is a rare find. This has to be one of the nicest, being fresh off a $44,000 restoration. Buy it and tear around the beaches – just like Steve McQueen in The Thomas Crown Affair. It’ll sell at no reserve and bring someone a lot of fun. Click here for more info and here for more from RM. This entry was posted in Uncategorized and tagged 1963, auctions, cars, classic cars, manx, meyers, rm sothebys by classiccarweekly. Bookmark the permalink.